Swing music authentic to the sound of the late 1930s/early 1940s. 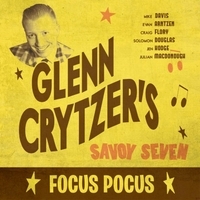 "Focus Pocus" is the debut album from the Savoy Seven - the newest project from internationally acclaimed swing bandleader Glenn Crytzer. This "extended play" record (EP) contains 7 songs, all composed and arranged by Crytzer and performed by some the finest young musicians playing vintage jazz today. The songs are originals, yet authentic to the vintage style in their composition, arrangement, performance, and recording style and the tempos and musical style are designed to be enjoyed by both listeners and dancers alike.